It’s been a couple of months since I last blogged – this is mainly because it’s been very hot in the UK, and I’ve been very busy. But also because, if I’m honest, I’ve run out of ideas for things to blog about. Bloggers’ block, if you will. When I first started blogging I wrote all the time, and was hugely active on social media. As soon as I finished something, I’d usually write about it but I soon realised I was devoting too much time to blogging when I should have just been getting on with music. So I started to just write them periodically and my ideas have recently sort of ground to a halt. However, I do know that some people find my musings enjoyable and I know that regular blogs keep my website and Facebook page up-to-date so that people know I’m still in business, so I’d like to spruce things up a bit on that front. So, my question is – is there anything you’d like me to write about? Anything you’d like to see on my blogs? Any ideas, suggestions, comments? No matter how crazy or boring, I will consider it! Either send me an email or reply to this on Facebook. Thanks for reading, and hopefully there will be lots more to come! 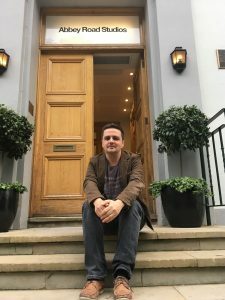 I can’t think of a good picture to accompany this post so please just humour me in re-posting the picture of me at Abbey Road. Okay? Cool.